You will enjoy the quiet and private setting of this lovely villa in beautiful Heritage Cove, a gated 55 and better community. This location is close to everything...the beaches of Fort Myers and Sanibel, the Fort Myers Downtown/River District, restaurants, shopping, theaters, airport, you name it. Heritage Cove has an on-site full time property manager, is socially active with a large community pool, a spacious community room for Holiday parties, shows, and pitch-ins to meet your neighbors, a large modern exercise room, computer room, bingo, bocce, tennis, shuffleboard, cards, etc. You pick your pleasure ! This lovely 2 bed - 2 bath villa is spacious with 1286 square feet under air plus front and rear screened lanais, and includes attached garage. 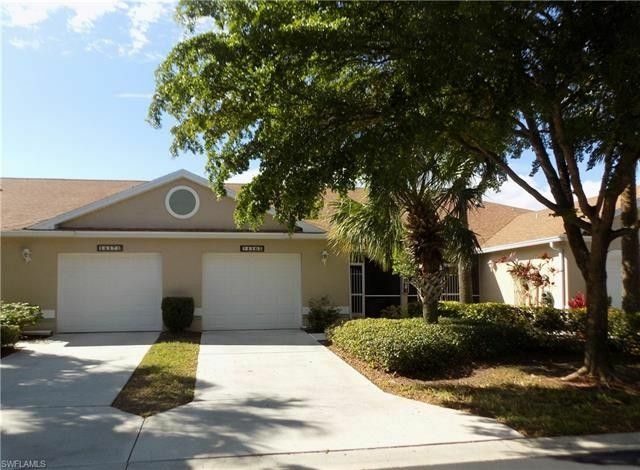 Relax watching spectacular sunsets overlooking a small lake from your private rear screened lanai, and enjoy SW Florida sunrises with your morning coffee from your front screened lanai...This has new AC and roof, and Internet-TV- phone, and landscape are all included in your maint. fees. This villa is offered fully furnished and ready to move in for the upcoming season. Call or text for your private showing. Directions: From Cyress Lake and McGregor, go south on McGregor to A & W Bulb...turn left into Heritage Cove .. Left lane to keypad for Gate....through gate to stop sign, turn right, then first right is Mystic Seaport....follow it around to 14165 on the right.